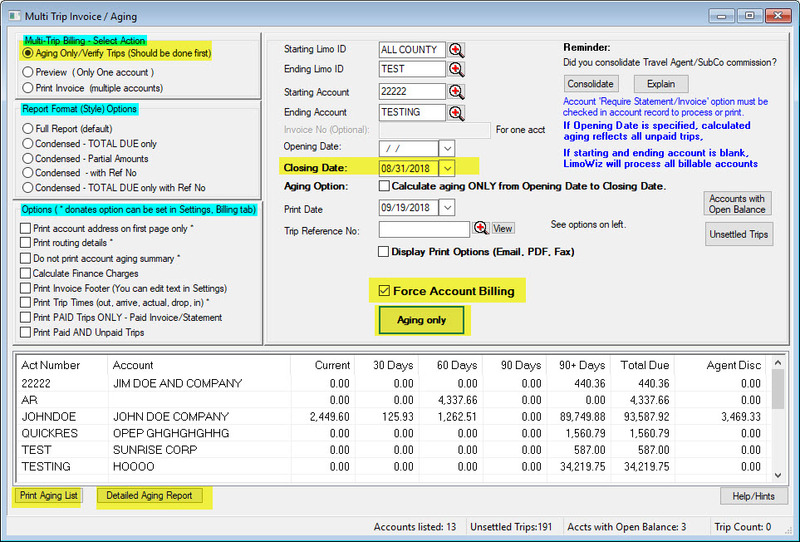 Subject: How to get a quick aging summary of billing accounts? To get billing account aging summary (current, 30 days, 60 days, 90 days, etc), go to Bill/Invoice and follow the screen option below as highlighted. If some customers are not being processed, this would be caused by not having Require Billing on accounts’ profile, however, click the Force Billing checkbox to include them anyway. Specify the dates and read the notes Blue color on the right-hand side. Also note the Aging Option if you want to calculate aging for the specified dates, otherwise any unpaid trips will be processed.